The Meonware were a colony of Jutes who probably embarked from Kent and came round Southampton Water and up the Solent to settle there shortly after AD 450. Their colony, which was also known as Ytena land (Jute land), existed in the Meon Valley, on the eastern side of modern Southampton, which was known in its earlier phases as Hamwic. The settlement was some thirty kilometres (twenty miles) to the south of Winchester, the capital of the proposed British territory of Caer Gwinntguic. A great many variations of the spelling of the name can be found, not only because the West Saxons used 'Y' against the 'I' used by the rest of the English, as shown by Yte, Ytan (genitive plural Ytena) versus Iote and Iotan which later became Eote, Eotan (genitive plural (Eot(e)na). A theory which opposes the AD 450 settlement suggests instead that these Jutes were the descendants of foederati who had been hired by the Roman administration in Britain to help guard the Saxon Shore against pirate attacks. This idea does not lack credibility, as these Jutes were certainly here at a very early point after the start of the Anglo-Saxon conquest of Kent. It is also entirely possible that if these Jutes were settled during the 450s, it was as hired mercenaries. Perhaps they were hired at the same time as Hengist and his followers in Kent, and for exactly the same reasons. David Slaughter suggests that since they are sometimes considered to have been Frisians, perhaps the fifth and sixth century Jutes who settled in Hampshire and the Isle of Wight came from southern Jutland, which was heavily dominated by the Angles, rather than the northern part of the peninsular. It is not clear precisely when they were conquered by the West Seaxe, but they retained their identity for at least two centuries. Bede refers to them as the 'nation of the Jutes', perhaps because they were free of external control, unlike the Jutes of Kent. There are few purely Germanic archaeological remains, especially from the area around the Solent, making it likely that the settlers were integrated into existing British settlements in the region. Apart from the authority of their hereditary chieftains, each Meonware settlement would have held thingsteads, or communal meetings, similar in function to the Saxon folkmoots. Unfortunately, we simply do not have enough evidence to try and reconstruct a theoretical list of minor Meonware kings. The Meonware sail around Southampton Water and along the Solent to settle in eastern Hampshire. They have either left the main host of Jutes who are just starting their conquest of Kent or, having made their way across the North Sea to join their countrymen, they decide to sail further and found a colony which is not under the control of their probably Angle masters. Alternatively, they could be the descendants of settled laeti who have integrated into British society and whose existence only becomes noteworthy from this point onwards. Almost nothing is known about them at any period during their brief independent existence, but they certainly exist in this location within a decade of this date. They are possibly seen by the British of Caer Gwinntguic and Rhegin as a threat, but not necessarily, if they have been settled there for some time and have integrated into British culture. Further settlements are established on Inis Vectis. By this time a Saxon settlement exists on the western side of the Solent, possibly descended from laeti who have been living there for much of the century. It is entirely possible that the Meonware share contacts and perhaps even some trade with them, but in this year the Saxons, or 'West Saxons', are conquered by Cerdic. With the initial conquest of the West Seaxe complete, Cerdic's attention is turned more fully to expansion from the kingdom's Hampshire heartland, possibly including the Meonware. A newly arrived Saxon chieftain and his two ships of followers kill a Briton of very high rank at Portesmutha (British Portus Adurni, modern Portsmouth, possibly the last surviving part of the proposed British kingdom of Rhegin which borders the Meonware to the east. Some scholars place Portus Adurni within Meonware territory of this period. After defeating Britons at Cerdices ford, Cerdic is declared king of the West Seaxe, although this kingdom probably does not yet include the Meonware. In a memorable victory, Sorbiodunum (Saxon Searoburh, modern Old Sarum) is captured from the Britons (of the proposed territory of Caer Gwinntguic, which is probably totally overrun at this time). This gives the West Seaxe mastery of central Wiltshire and Salisbury Plain. It also means that if the Meonware have retained any independence to this date then it probably now ends. Even so, right up until the end of the sixth century, the West Seaxe seem to be less a single united political entity and more a collection of tribes who acknowledge the king as the overall figure of authority, but perhaps not someone they have to follow without question. A Frankish bishop named Burinius, consecrated in Genoa by the archbishop of Milan, arrives in Britain and preaches to a pagan audience in Dorchester-on-Thames. In 635 the West Seaxe King Cynegils and his son Cwichelm are baptised there. Bishop Birinius continued his priesthood amongst the West Saxons until his death in 650, when another Frank, Agilbert, follows him as their bishop. The thinking here is that the Meonware might also be converted to Christianity at this time, before Cynegils dies in 642. 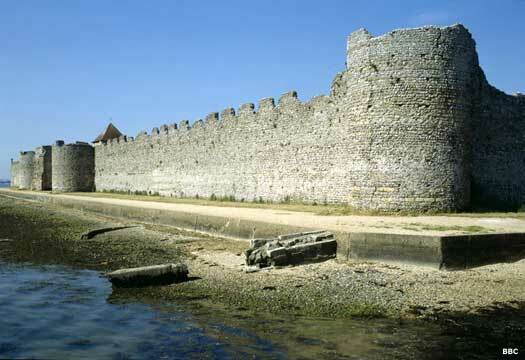 However, it is probably not possible to establish whether there is a mission amongst the Meonware like the Irish one at Bosham of the Suth Seaxe. The Meonware (still recognised as a separate people) and the Isle of Wight are ceded to the Suth Seaxe by Mercia. The Norman Domesday Book records the place names of the Meon Valley and it is notable that most of them have a Saxon character, although there are exceptions, such as Fareham. The inference is that while Jutish identity has perhaps survived for a long time in the region, the Jutish language has not, being replaced over time by the Old English of Wessex.